Think of Switzerland and one invariably conjures up images of the country’s iconic spirit animal – the contented cow – languidly chewing the cud against a back-drop of alpine wildflowers and snow-capped peaks. This is one national stereotype with more than a grain of truth to it. The country is literally overrun with the beasts! There are over 1.6 million cows in Switzerland. With a human population of almost 8 million, that’s one cow for every five people! In smaller rural cantons, however, the ratio is 1:1. 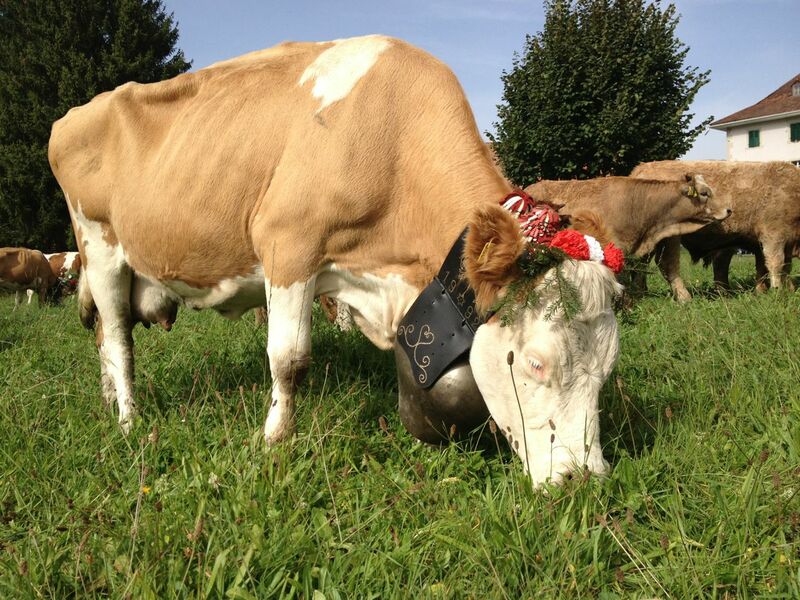 The cow remains central to the economic and cultural life of many parts of rural Switzerland, and there are community events and festivals held during the year to mark the various phases of the bovine calendar. Of the country’s 1.6 million cattle, about 600,000 are dairy cows. Most of these are “Swiss Browns”, a breed prized for its high quality milk, which is used in cheese and other products. The industry is worth billions of dollars to the Swiss economy, and is intimately tied to tourism as well. There are 32,000 dairy farms in Switzerland, the vast majority of which remain small, family-owned operations with an average of 20 cattle. The industry has been heavily regulated and subsidized in the past in order to support the viability of the family farm and prevent rural depopulation. Ensuring that Switzerland is dotted with cows is not only politically popular among the Swiss, it draws millions of foreign tourists each year, who expect to take home iconic snapshots of the bucolic Swiss countryside, along with their watches and chocolate. Typical Swiss farm family in Charmey. Having said that, the Swiss family farm is coming under mounting pressure thanks to deregulation and structural change in recent years. Milk prices, for example, have fallen dramatically, reducing farm income. While Switzerland has yet to experience the kind of rural depopulation witnessed elsewhere in Europe, the number of viable farms is diminishing. 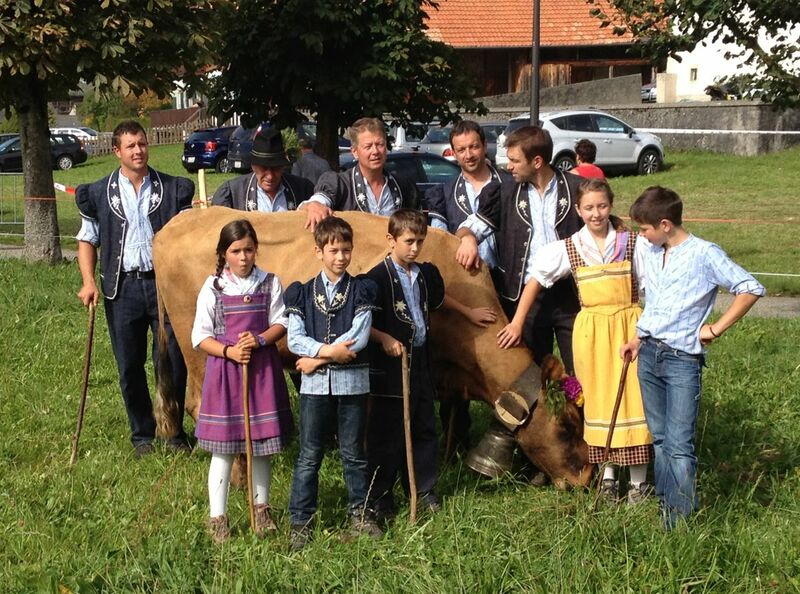 Having said that, the cow remains at the centre of cultural life in rural Switzerland, with a series of community events and festivals that, in addition to celebrating rural life, are increasingly important to the Swiss tourist industry. 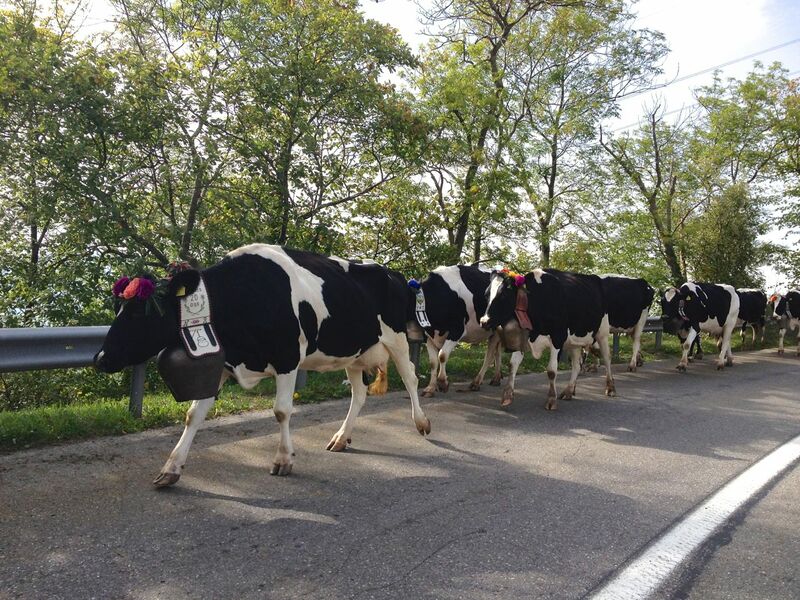 Perhaps the most important of these festivals are the rituals of escorting the cow herds up to their summer alpine pastures in spring and back down to the valleys in the fall. The spring ritual is called the “alpages” or “poya” here in the French-speaking cantons, and the fall ritual is referred to as the “désalpes“. Other festivals mark the autumnal “sharing of the cheese” – in which the cheese made from the local cows’ milk is distributed back to the herder’s in proportion to the amount of milk their cows produced – and the “cow fights” of canton Valais, in which alpha-females from different herds battle head-on (literally) for the title of “Queen cow”. Charmey cow, dressed to kill for the desalpes. A few weeks ago we had the privilege of witnessing a couple of different festivals revolving around the cow. 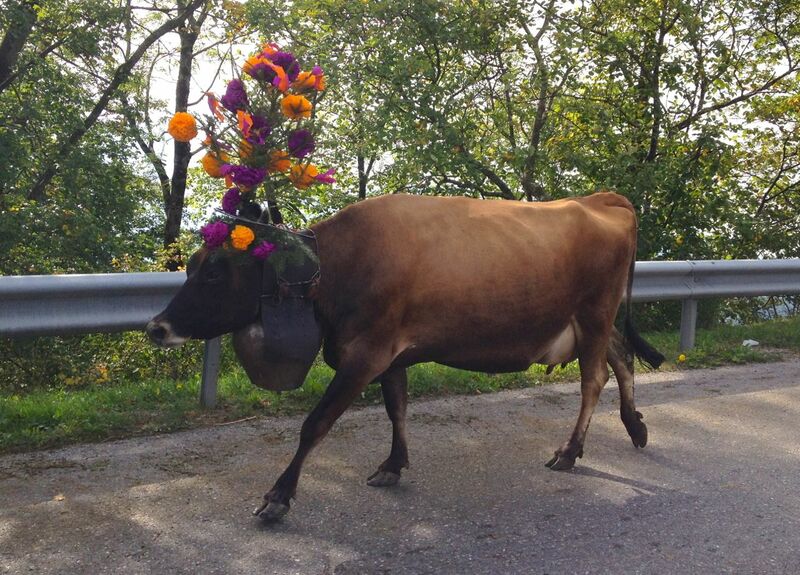 Firstly, we witnessed the désalpes in the village of Charmey, a somewhat touristy but charming and genteel affair, in which the local cowherds were paraded down from their alpine pastures while wearing decorative floral head-dresses and massive bells around their necks. Accompanied by their owners’ families and farmhands, who were all dressed in traditional garb, the cows were marched down the main road and through the village back to their fields and stables in the valley bottom, where they spend the winter. The village of Charmey was packed wall-to-wall with locals as well as tourists from the surrounding area. All day long they watched the procession of herds pass through town, while sampling local food and drink. 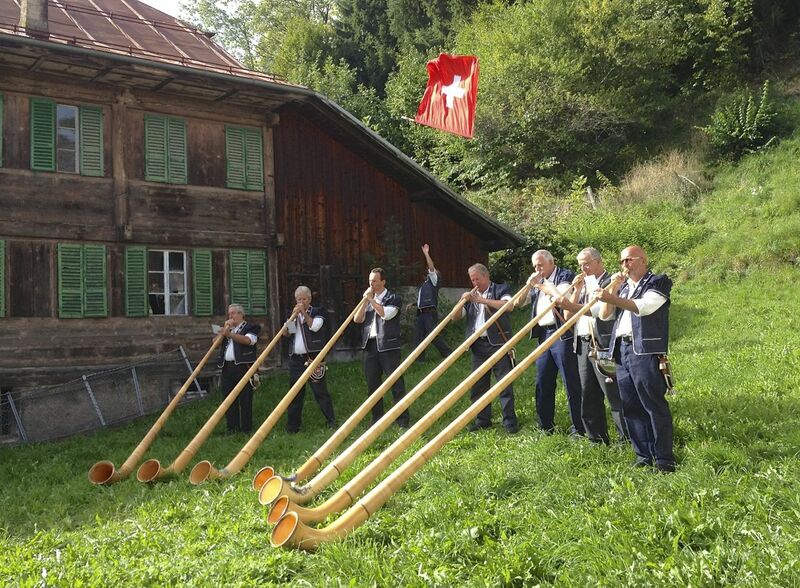 Folks singers and a troupe of alpenhorn players provided musical entertainment. The last herd passed through town by about 4 pm, followed by a long procession of cars trying to make their way home. 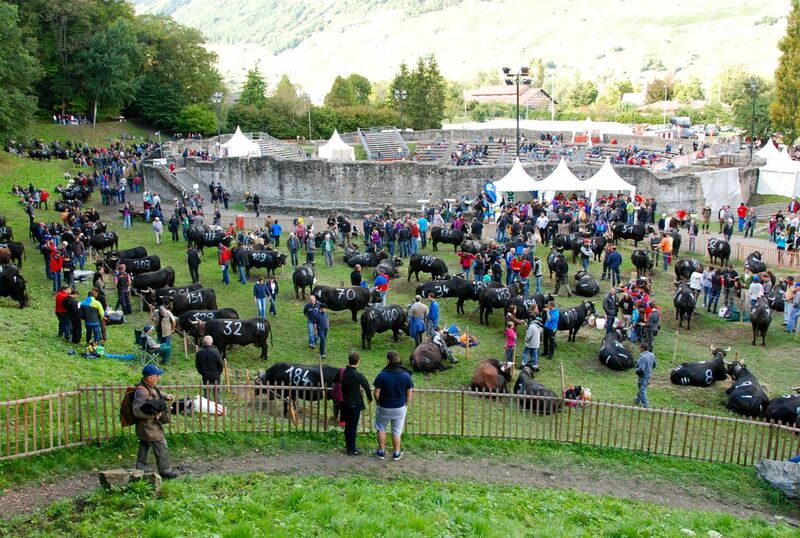 Two weeks later we traveled to the town of Martigny to witness the “Combat de Reines,” a gritty and somewhat redneck affair, in which enormous female cows from different herds duel for supremacy, with hundreds of spectators looking on. This is a traditional autumn event in the Canton of Valais, held after the cows are brought down from the high mountain pastures. 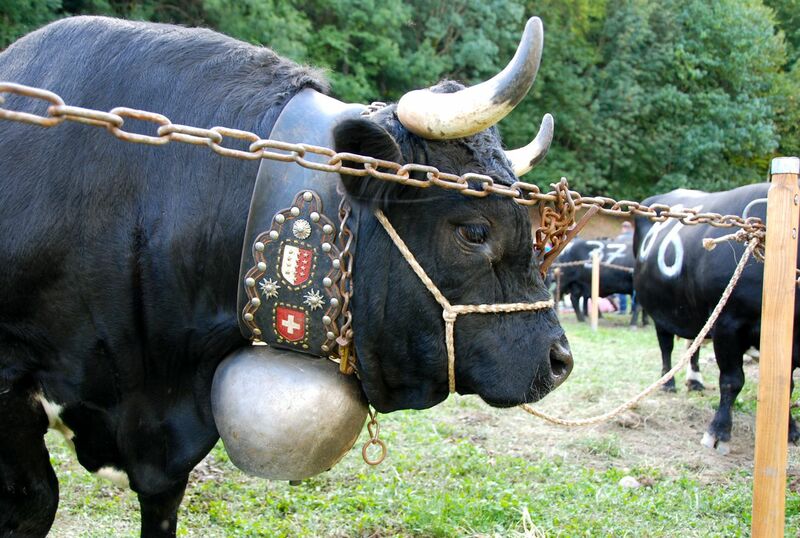 A typical Queen cow from Valais. “Queen cows,” a kind of bovine alpha-female, from various herds are entered in the competition to compete for the title of “Reine d’Hérens”. The Valaisienne “Hérens” breed is renowned for its aggression. 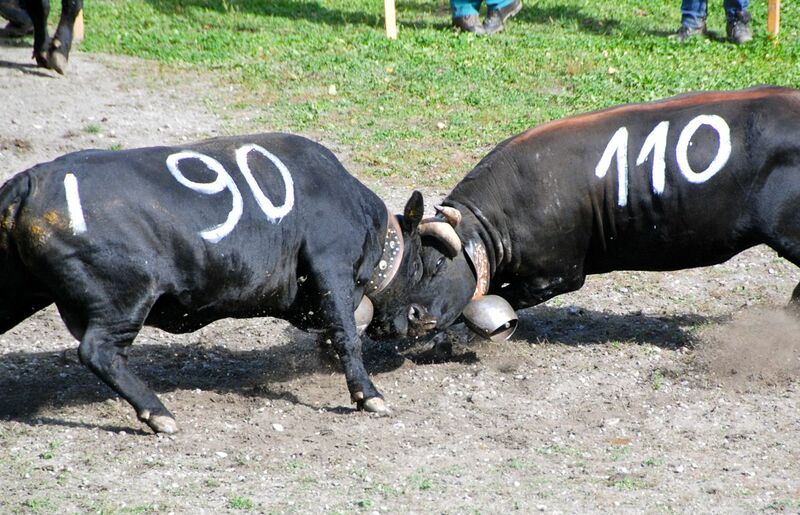 Weighing up to 900kg each, the cows are paired off in a series of head-to-head duels held inside a restored Roman Amphitheatre (I’m not making this up!). Contestants waiting their turn outside the amphitheatre. After entering the ring 3 pairs at a time, the cows posture and paw the dirt to try to intimidate one another. Sometimes that is enough to decide things, as one cow walks or runs away. Usually, (although sometimes with a little coaxing from their human handlers), things escalate and the opponents lock horns and shove each other around until one breaks off the duel and walks or runs away. Two queens battling it out. Duels last anywhere from 10 seconds to 10 minutes, and the crowd erupts into applause at the conclusion of each duel. Winners move on to the next round. Injuries are rare, but they do occur, and we saw one poor girl with the tip of a horn broken off. The Combat takes place inside a restored Roman amphitheatre. 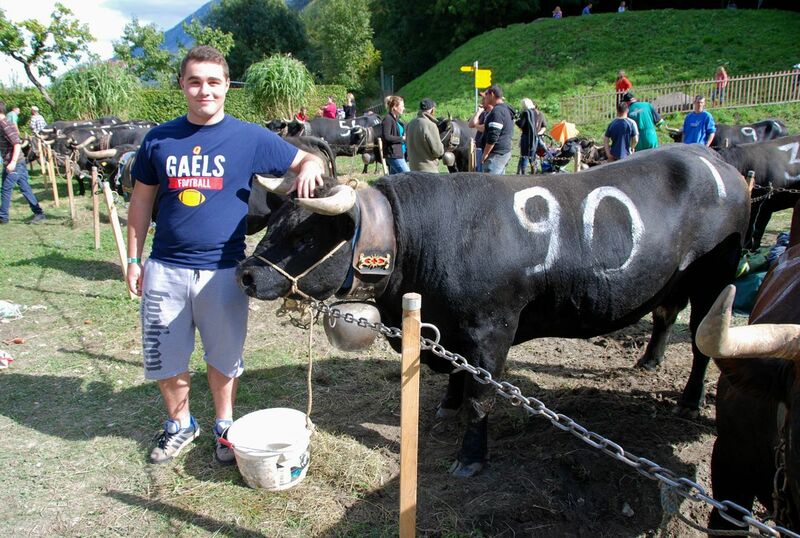 Our son Lachlan took a shine to one gal named “Frimousse,” who weighed in at almost 700kg, and we all began rooting for her. In the end, Frimousse placed 6th overall out of almost 200 contestants, but was no match for the eventual winner – “Pouky” – who weighed in at almost 900kg! The winner gets a pat on the head and a handful of grass and wildflowers, while her owner gets bragging rights and up to 5000 Euros in breeding fees for every calf born to her. Lachlan and his champion, “Frimousse”. I confess to feeling a bit squeamish about the whole thing, but it was a big community event with an air of authenticity about it, unlike the much more genteel but touristy désalpes. We heard few languages spoken in the crowd other than French, and there wasn’t a tour bus or alpenhorn in sight. Finally, this past weekend found us in the village of Gruyères – home of the world famous fondue cheese – where we toured a local cheese factory. 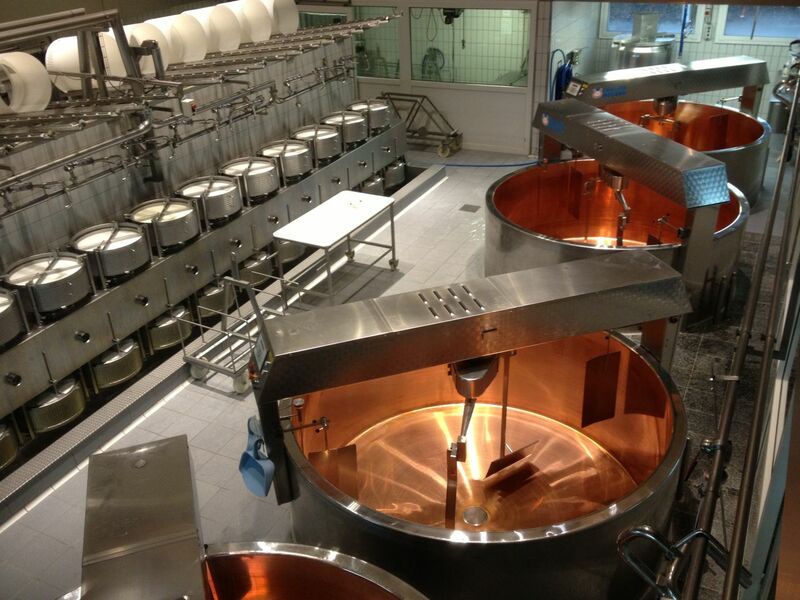 Most of the milk from the cows in this area goes into the making of this world famous cheese. The cows are fed a strict regimen of alpine grasses and wildflowers in summer and hay in the winter, which is said to lend their milk and cheese their distinctive character. Cheese-making equipment at the Maison du Gruyeres. Each cow consumes an average of 100kg of grass and 85 litres of water per day, in turn yielding approximately 25 litres of milk per day for the farmer. Local farmers bring their milk to the cheese-maker every day, where it is poured into huge vats to be heated and made into cheese. It takes roughly 400 litres of fluid milk to produce one 35kg round of cheese measuring about 2 feet across and 4 inches thick. 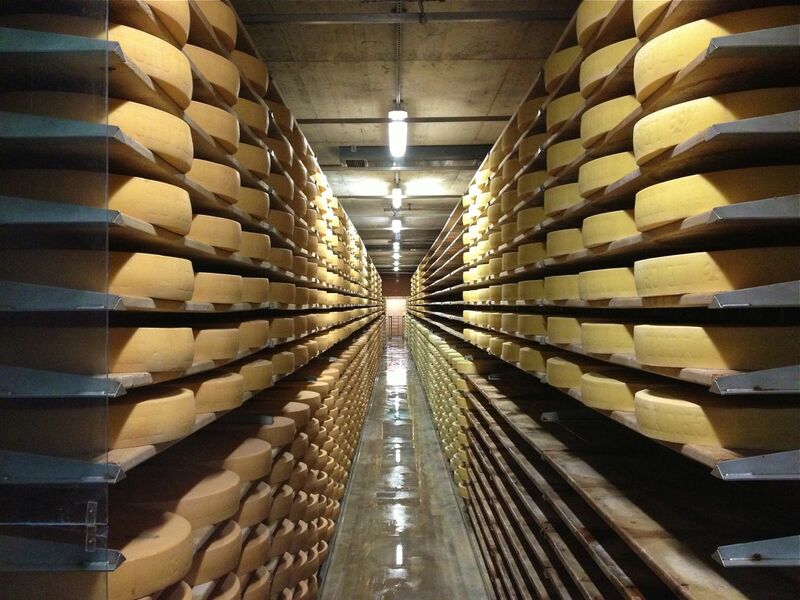 It takes 400 litres of milk to make one 35kg round of Gruyere cheese. After heating, the cheese curd is skimmed off and poured into circular molds in which it is then pressed under up to 900kg of pressure. After a day or so under pressure the molds are then soaked in brine before the round of cheese is extracted from the molds and placed in a cellar for up to a year of aging. Cheese-cellar at the Maison du Gruyeres. The resulting cheese is creamy white in colour with a rubbery texture, a nutty flavour and a very pungent bouquet. 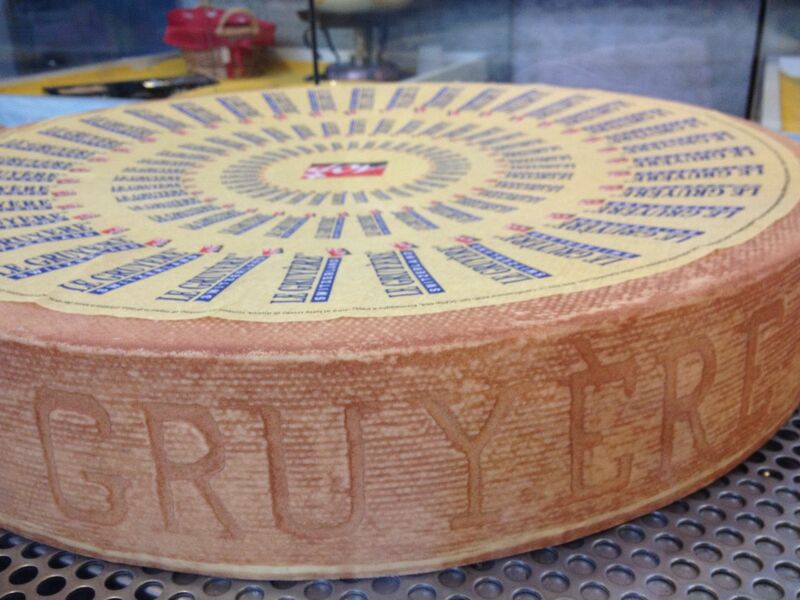 Gruyères, along with Emmenthal, is typically eaten in fondue. The Swiss also enjoy eating it raclette style, thinly sliced and melted on a piece of bread, accompanied by a nice glass of dry white wine. Now THAT is something definitely worth celebrating!